The issues of Iranian women in February and March ranged from horrible cases of domestic violence against women and girls, honor killings, acid attacks, child abuse and early marriages to suicides including by pregnant women and young mothers, to violence against women prisoners in Shahr-e Rey (Qarchak) Prison, and stepping up pressure on political prisoners by unjust verdicts, most oppressive of which was the 38-year sentence plus 148 lashes handed down for the human rights lawyer Nasrin Sotoudeh. All these issues, however, were overshadowed by devastating floods which inflicted horrendous damages and great losses of lives on the nation across the country. 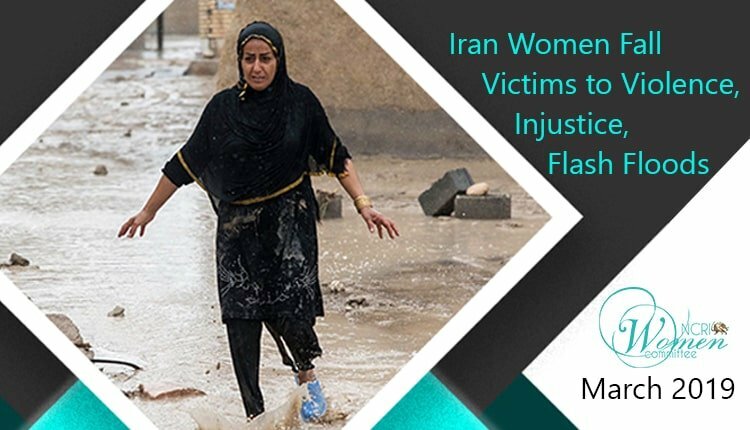 The NCRI Women’s Committee Monthly Report – March 2019 has glanced over the situation after the flash floods and focused on women political prisoners who are enduring the brunt of pressure. In the final days of March and the beginning of the Persian New Year, Iran was hit by a wave of rainstorms which caused devastating flash floods throughout the country. Dozens of cities and villages drowned and thousands of people lost everything they had. The state agencies and media have tried to minimize the number of casualties down to 19. However, scattered reports by people from various provinces set the number of deaths at 200 in the least, most of whom were killed in Shiraz after a 10-minute rain storm. Among those who lost their lives were dozens of women and girls. After three years of imprisonment, the human rights lawyer Nasrin Sotoudeh was re-arrested on June 13, 2018, to serve a five-year sentence issued for her in absentia in 2016 on the charge of association and collusion with the intent of sabotaging national security, by citing a sit-in outside the Justice Ministry’s Lawyers Guild. While she was in prison, a new file was opened for her which included seven more charges. Her case was examined in December 2018 and again on February 4, 2019, by Tehran’s Revolutionary Court in her absence and while the lawyer of her own choosing was also prevented from attending the trials and handling her case. Read the NCRI Women’s Committee Monthly Report – March 2019.